Did it again, today. Transom #4 done! Had a good weather forecast, so I pulled the motor last night, and made sure everything was ready. (PIC 1) Already had 2 buckets of Seacast ready to go. Fired up the chain saw and went to work. The mulch was flying! (PIC 7&8) Took about 2 hours of cutting, chiseling, scraping and vacuuming to get all the old wood out. It's amazing how fearless I've become with the chainsaw. Taped up all the openings and then mmixed up a very stiff batch of Seacast, and started packing the sides. Was able to get it to stay nicely. Cut a strip of plywood to hold it up and clamped it into place. Now it was time for the main pour. I mixed and poured and mixed and poured. As it filled up, I pulled my temp dams from the sides. Eventually, I got to the top, and glassed it in with fiberglass tucked in with a flat blade. The glass cap helps keep the stuff in place until it sets. After about an hour it started to kick. I watched it until it had all warmed up and was getting hard. Tomorrow, I'll clean everything up and install fresh aluminum capping. Then re-drill the scuppers, engine bolts, etc. If all goes well, the engine will go back on tomorrow. Hopefully, this helps someone. Obviously, I highly recommend Seacast. You gotta LOVE when you can do a transom replacement in a day, and will never have to do it EVER again! I can't mount the motor tomorrow. 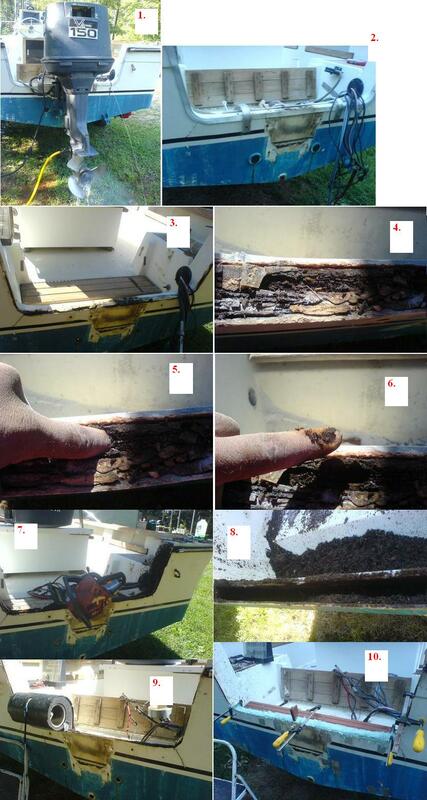 I have to glass and gelcoat the old stress cracks from the soft transom. You can see them in both corners of the motor notch. That should only take a few hours, so maybe I can get the motor back on Wednesday. I guess we will see. If you are gonna glass the stress cracks, I would say glass a new cap over the top of the transom instead of using the aluminum cap. 1. How hot did the transom area get once it starts to kick off? Hot enough that you could not hold your hand on it? 2. What kind of prep is needed once the wood core has been removed? Is sanding or wiping down with acetone required? 3. How does the cost and weight compare to NidaPour? I think the only difference between the two is SeaCast has recycled fiberglass in it and the NidaPour using ceramic spheres for filler. You probably can't tell from the pictures, but the top of the transom IS glassed. The SeaCast wet out the glass, hence that bluish color. I like my aluminum capping system- it's clean and good looking. It's not structural. 2. Truth be told, you only have to scrape the fiberglass clean and blow it with compressed air. But it must be DRY before you pour. Hence, my blower setup. More prep wouldn't hurt, but that stuff has some wicked-strong adhesion strength. I don't know what they put in it, but even on waxed gelcoat, it can be a pain to get off. Once that stuff cooks inside the transom, it's DONE. That stuff really fuses to everything it touches. For what it's worth, if you notice in the pictures, I set a mahogany block on top of the transom as a spacer for the clamp to help keep everything straight. The wood was sitting on top of the fiberglass, just barely pushed down enough to catch the skins. Today, I went to pull the clamps off, and I was trying to knock that wood out with HAMMER. NO DICE. That thing was FUSED in there! It actually amazed me, and I've done this before! I ended up sawing it off and leaving that little piece stuck there. But I must say, that REALLY boosts my already-high confidence even more. 3. FWIW, this has micro-spheres in it, too. BEFORE you put in the fiberglass, its similar to what the NidaPour looks like in the videos. But then you add the glass, and in your gut you KNOW this stuff is going to be ridiculously strong... and it IS. What is cool is the fact that it FLOATS in water. No idea how they pull that one off, but it's true. I actually thought about trying the NidaPour this time, but it was the same price. And even if it was $50 cheaper, I personally think the Seacast is just stronger stuff. Hard to argue with results! HEY... I just noticed that you are in Suffolk. Are you on Tidalfish.com? (I'm "thill" there, too) Do you fish the CBBT area? I fish the CBBT all of November and December. I'm about two hours northwest of you near Fredericksburg and Lake Anna. Feel free to give me a call, and/or come up and check this stuff out for yourself. I know it seems fishy when EVERYONE says the same thing as the testimonials, but this stuff is really legit. I wonder what the weight difference would be between seacast vs. coosa board ply. Seacast seems to be the more user friendly,quicker way to tackle it, but Robalos tend to be stern heavy as it is. Any reduction in weight would be a plus. Small world, TH. Yup...I am on tidalfish on occasion fish every chance I can. Lower Chesapeake and ocean front for stripers. Looking forward to the season re-opening so I can play with the schoolies in the evenings at the Hampton Roads Bridge Tunnel since I can be in the water 30 minutes after leaving the house! I also realize now that you are the same one I sent that snap installation tool to back in 2009. Did you ever get that darn top finished?? HEY! Yes, that's me. Small world! Good question. I got the enclosure made, but I never got around to fitting and trimming it to the boat. But since then, my life has changed, and I just don't fish very much. Interestingly, I'm planning on putting my boat on a lift this fall, (to make it easier to go fishing) and I've been thinking about finishing that enclosure this week. I could probably do it in an afternoon or two. The lift I'm renting is in Lynnhaven, so maybe we could go island hopping for some stripers this fall? Let me know what you think. Would be cool. That sounds like a definite plan to me! I am looking forward to the season opening and start chasing those critters again! I just checked the TF boards... Still some cobes around, big reds, blacks, flatties, pups, tog, croaker, sheepies- LOTS to choose from! I'll let you know when I get the boat down there. I'm hoping for Thursday or Friday of this week. Once I finish cleaning up the transom, I have to swap out the tilt/trim unit and re-mount the engine. Unfortunately, work keeps getting in the way! I know what you mean about things getting in the way...except mine seem to be on weekends when I should have some free time. Cobes are starting to get to be slim pickings, but Lynnhaven is full of pups. I saw those reports of the reds and must admit I would not mind getting into them again...been a few years since I targeted them. It should be interesting to hear the initial reports once striper season opens. Heck, schooly sized fish taste just as good as their bigger brothers that show up around December! Yes, they do, but two 18" fish don't have much meat on them! Season opens Thursday, right? Throw a cast net and get a bunch of finger mullet, and you never know WHAT you are going to catch! For some reason, the reds like them cut up more than whole, it seems. I catch lots of them by accident on jigs around the islands and under the bridge, especially at night. My weekends are always booked up, so I have to sneak out on weekdays. Took a trip to the CBBT last week. Found lots of pups, bluefish, keeper black seabass, and (surprise) ribbonfish! These are officially known as "cutlassfish" and they look like their name indicates, a cutlass. They have the head of a barracuda, teeth and all, and a beautiful silvery body that ends in a point. will be back down soon. We have been working the pups hard up in Bennetts Creek (just off the Nansemond River). Fresh, cut mullet has been the bait of choice and they are a blast on light tackle. Actually been kinda nice to jump on my bike and ride down the street 5 minutes and be fishing. Depending on the weather this weekend, I am thinking of running out of Rudee Inlet and head down just below Sandbridge. Plan is to troll some Stretchs in about 15 ft water just off the beach and see if any big drum are to be had. Heard some good reports a week ago and figured why not. Just not in the mood to fight the weekend warriors at the CBBT yet. I actually didn't take any pictures this time. I took one of a ribbonfish, but it had spun and you couldn't see it in the pic, so I deleted it. We were just throwing jigs and plastic. The ribbonfish were swarming around the 1st island! We caught more of them than bluefish for a while. That was the only way we fished. We got the pups and trout the same way. Most were nice keeper size, compared to what I heard about up in the inlet. What size pups have you been getting? I absolutely HATE fishing on the weekends! I'm actually thinking of coming down tomorrow night, just to avoid the weekend nonsense. LOVE having the boat on the lift! Makes it so easy to just run down for a quickie trip. Will report back. AND AS FAR AS THE TRANSOM goes, I'm still waiting on the tilt/trim unit replacement before reinstalling the motor. Just curious, how is the seacoast transom holding up after 5 years?